In the title of this post it is stated that the not-for-profit BIE is a goldmine of resources. In fact, I suggest upon entering you may just think you have discovered the mother lode for PBL! Simply stated by the people at BIE, “ The Buck Institute for Education (BIE) is dedicated to improving 21st Century teaching and learning throughout the world by creating and disseminating products, practices and knowledge for effective Project Based Learning.” As you explore the website you soon discover how dedicated the people at BIE are at fulfilling this mission. 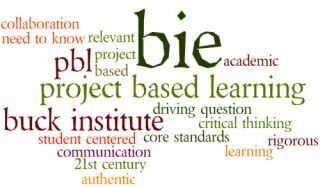 For those still trying to discover what PBL is all about, visit this wonderful page describing PBL, and its connection to important 21st century skills such as collaboration, communication & critical thinking. Don’t miss an informative research page written to answer many questions you may have. In their amazing PBL library resource center you will have access to 25 research documents in the categories of Synthesis, Practices, and Outcomes. Another page lists a series of references accumulated from 40 years of studies explaining why PBL works. Perhaps you will want to explore the nearly 70 short videos documenting , explaining, and giving an overview of PBL . While you’re in this area be sure you watch the video entitled Project Based Learning: Explained.This is a wonderful video created in the Common Craft format explaining PBL in simple and understandable terms. Perhaps you are a teacher ready to create a PBL project for classroom use. Make sure you visit a relatively new area entitled PBL Do It Yourself. From here you will be asked to sign up for a free account. Make sure you sign up! In this area you will discover ideas and lessons that will advance your understanding and help you build your own PBL unit. Included are electronic forms, articles, rubrics, instructional videos, and various other planning tools. There is a place to ask questions and also be sure to look over all the available downloads. You may wish to discover PBL units others have made. This is a great place to get ideas and even get started with integrating PBL into your curriculum. I suggest that before beginning even a pre-made unit you read the information in the PBL Do It Yourself area. This will help you better understand important concepts such as entry event, driving question, need to know, and a project vs. a dessert. Along with these outstanding unit,s be sure to read articles in the blog areafurnished by some outstanding contributers.